August is a great month for anglers for many reasons; day after day of sunny, mild weather, the opportunity to send the kids off to the ekka with the grandparents one, two or seven days in a row! Plus the month usually is strong for winter species and we see the return of elbow slapper whiting and flathead in greater numbers in the rivers. I like to review the winter fishing season thus far in August, to either rejoice or rethink my game plan! The full moon for the month was last night and the past 3 days have been good with reliable locals weighing in their offshore and estuary species like clockwork. I expect this weekend will also see good weigh-ins as well. The 3 days following the new moon which is on Friday 21st to the 24th are also looking good for fishing, according to the Anglers Almanac. These two moon phases will play a huge role for those keen anglers chasing big jew and the run of tailor along the beaches overnight. The deeper holes around bridge pylons, rock walls and river bends are well worth fishing with live or big slab baits for jew. Hopefully there will still be a few nice sized yellow fin bream for the end of the season to keep those gung hoe bream anglers happy. We can expect less bream next month and the dusky flathead should be firing up and more readily taking lures. The increase in water temps should get the old faithful dusky’s to chase trolled hard bodied and soft plastics lures. These fish provide recreation sports anglers with consistent catches and a responsible fight. Just remember that with the increased technology provided by lure manufacturers to help angler catch fish, we are really putting a dent in the wild flathead numbers. Only keep enough for your own immediate needs and release big females over the 70cm mark. Take a camera with you in your fishing travels and if you catch a nice fish, get a photo to show your mates proof, you won’t have to kill the fish to look good. The beaches have really picked this year with excellent schools of tailor are along most SE QLD coastlines, with some record fish getting caught on South Straddie, Noosa and Kawana Beaches. Those south westerlies brewing in mid July, were just cold enough to hurt my bottom lip which is a great indicator that winter beach fishing is at its peak. Pillies were on the mark, sometimes with a squid-skirt on a 3 gang of 4/0 Mustad 4200D’s. Reports came in also of decent greenbacks on the odd bit of local squid on a similar rig, Surecatch knight or bishop or Halco Twisties in 40 or 50g. Sometimes the tailor go off the bite and you are left with over ½ a block of pillies thawed. Freezing them to use them again only leaves us disappointed at the mushy composition. Next time consider using the South African product called Bait Mate, really just glorified elasticised cotton, but it really works well when your pilchard has turned to mush. The Noosa, Maroochy and Mooloolah rivers plus the Passage have offered good bream to 23kg this winter so far, but many catches are coming in between 600g and 1kg. The bream have been best at night or the top of the tide as they are spawning at this time of year. A lot of quality fish have been caught off rocky headlands like Pincushion Island, the new Cotton Tree jetties, Twin Waters weir area, South Channel and at the Cod Hole. Yinni Street has also been a favourite spot for bank fishing. Thin strips of mullet fillets, pealed green prawns, pilchard, gar or bonito fillets provide a soft, yet deadly bream bait. If you find your flesh bait is getting ignored, it may just be too bland so coat it in an additive like aniseed or tuna oil which acts as an aphrodisiac and usually brings on a feeding frenzy. Flathead usually start to move more in the late winter months as well. Lures and fresh bait cast over the top of sand banks in the lower reaches is the best option. A few big lizards, well and truly breeding size were also caught and released in the upper reaches. The stretch of water between the mouth of Petrie Creek and the Bli Bli bridge is an excellent flathead fishing spot. In the coming months the numbers of big summer whiting should be on the rise in this location as well. Once we have a rise in water temperature, this encourages the flathead to move around a lot more and chase down food easier. Lure fishing will be successful in the coming months along this stretch of water also. Working soft plastics while drifting in a canoe or boat can be affective. At this time last year I trolled small lures such as the Tilsan minnow and Micro mullets on the run out tide along Bli Bli for plenty of dusky flathead. 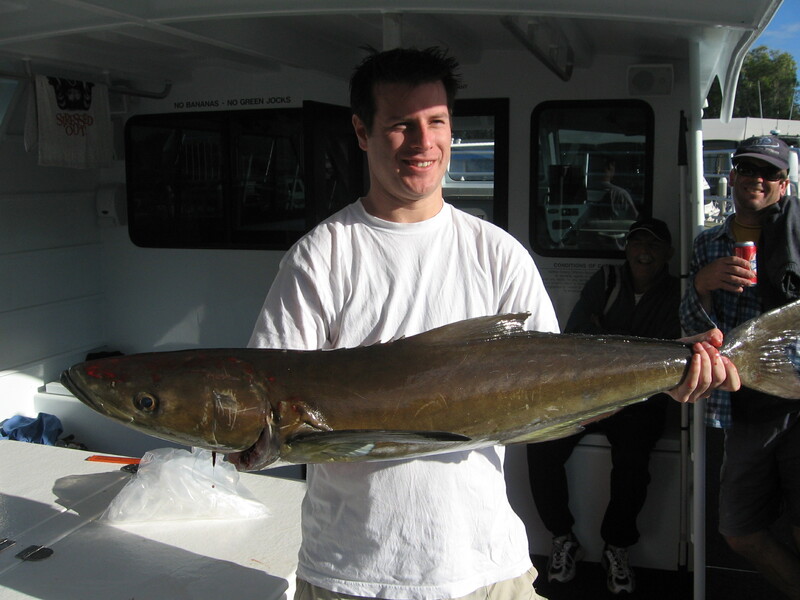 The same shallow water should fish well for whiting in the near future. Their numbers are already increasing and should continue through September. Try on most stages of the tide with live worms on the sand banks around the Bli Bli channel markers. With the temps warming and Spring just around the corner, get out amongst the last of the winter fishing action and be prepared for the warm weather to lure in those summer species in the coming months. Noosa: Snapper to 5kg on North Reef. Tailor to the 1kg and a few dart along Teewah. Mud crabs in the canals and upper reaches. Bream and whiting along Castaways Beach. Good numbers of flathead in Lake Cooroibah and along the ski run. Whiting and bream from Munna Point and the Frying Pan. Maroochydore: Tailor at night along the north shore and bream up to 800g in good number from the river mouth in the morning. Bream at dusk around the coffee rock along Mudjimba Beach. Big flathead and quality bream in the southern channel. Mud crabs overnight from the mouth of Eudlo Creek. Kawana: Amberjack to 20kg and parrot to 5kg from Murphy’s. Dart, bream and Tarwhine along Kawana Beach. Schools of gar throughout the lower reaches. Tailor and gar from the Kawana pontoon. Golden trevally along the La Balsa stretch over night. Flathead from the sand basin and the flats above McKenzies Bridge. Caloundra: Snapper and grassy sweetlip from the 9 mile and Currimundi Reef. Dart and bream along Currimundi Beach. Tailor and bream at the bar. Trevally and queenfish on poppers in the Pelican Waters Canals. 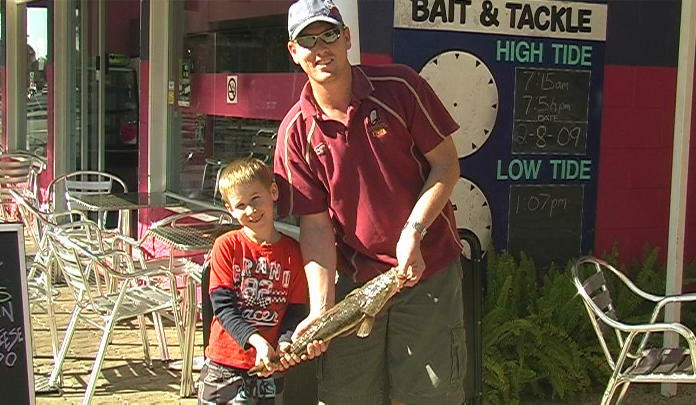 Riley and Matt Evans welcomed the warmer weather and the flathead which came out of hibernation to bite Riley’s prawn bait. 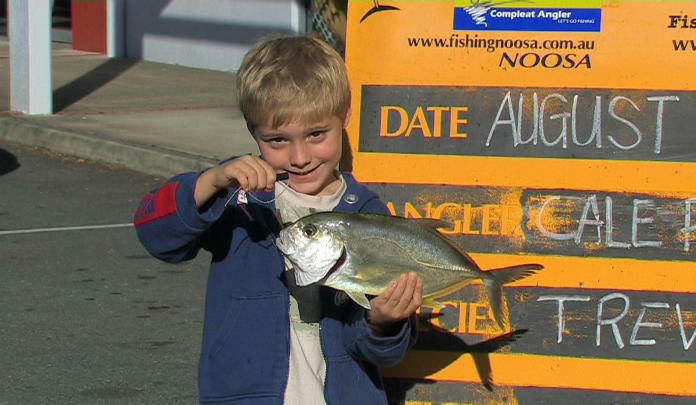 Six year old Cale Page was fishing at Munna Point when his live yabby bait was taken by this 900g trevally (with thanks www.fishingnoosa.com.au). 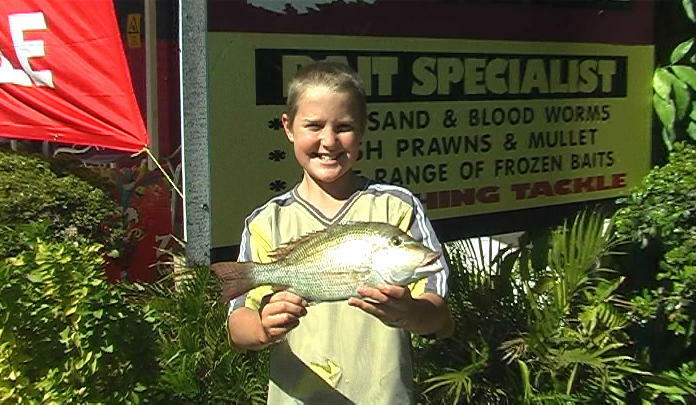 Jake McLennan fished just off Point Cartwright with whole squid to lure this Sweetlip up close to the boat. Paul Smith got lucky and landed this 10kg black king fish aboard "Fishing Offshore Noosa" charterboat Trekka 3 at North reef.